Fiffi Fox is hand made in the finest russet cuddly soft woven fur. 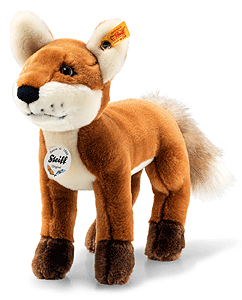 Every day is an adventure together with 22 cm tall, red-brown Fiffi fox made from incredibly soft faux fur. The enchanting airbrush details at the corners of her eyes, the bridge of her nose and on her mouth and her black whiskers give Fiffi fox a very realistic look. Adorable Fiffi fox's inner ears and stomach are cream-coloured. The supporting rods in her legs help her perfectly keep her pose. The lovable fox has another charming detail in her bushy brush with a cream-coloured tip.